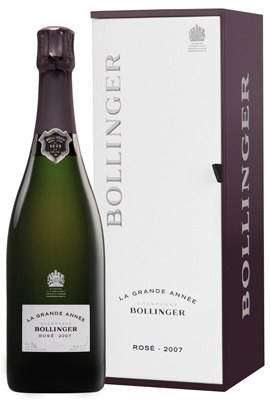 This is Madame Bollinger's ultimate gift, the result of rare conditions: a blend between a great champagne and one of the very best red wines of the Champagne region, both from the same vintage. The quality and power of a red wine produced from the legendary Côte aux Enfants, a single plot of Aÿ Grand cru Pinot Noir. A delicate coral tint. To the nose, Redcurrant and dried fig aromas accompanied by a minty touch: notes of blond tobacco and dried flowers. A wine with fine, delicate flavours; notes of mirabelle plum, kirsch and freshly cut grass; a beautiful aromatic structure. La Grande Année Rosé 2007 enhances and complements perfectly the subtlest gourmet experiences. You can enjoy La Grande Année Rosé 2007 right away, or choose to age it in your cellar. Exclusive use of the cuvee. Fermented entirely in barrels. 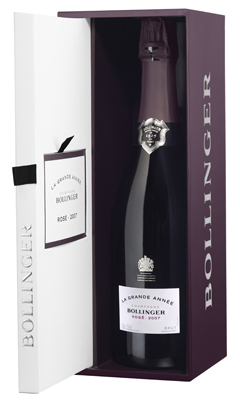 At Bollinger, only very high quality harvests become a vintage: The year 2007 was an exceptional one, revealing a very refreshing champagne that brings out the full impact of the fruit. Sealed with a natural cork whilst ageing. Dosage: Low, 7 grams per litre. Blend of the 2007 vintage: 72% Pinot Noir, 28% Chardonnay. 14 crus: mainly Aÿ and Verzenay for the Pinot Noir; Cramant and Oger for the Chardonnay - 92% Grands crus and 8% Premiers crus. 6% red Côte aux Enfants wine. La Grande Annee Rose is an extension of the Grande Annee by the addition, at blending, of a red wine from one of the House's emblematic vineyards, La Cote Aux Enfants, located in the village of Ay. This plot of Grand Cru, measuring less than one hectare, is only used for red when the grapes are perfectly ripe.